Jen at the Inu-Baka blog had a great post the other day about time-outs. It may be tempting to think of a time-out as a punishment, but I think of them more as training tools. For many dogs rescued from shelters, impulse control is a key life skill and one that will serve them well with prospective adopters. A lack of impulse control may well be what landed them in the shelter in the first place. For many breeds, including the pit bulls that comprise the bulk of the shelter dogs in my area and that happen to be my two current foster dogs, a tendency toward impulsiveness is what often gets labeled "aggression" and is used to justify their "unadoptability' and death sentence. Helping these dogs learn to dial it down, to take a break when things get intense, to have an off-switch that is as well-developed as their on-switch, can be a lifesaver for them as well as a huge help to us, their caretakers. Some degree of wild play is appropriate and healthy, especially for some breeds. 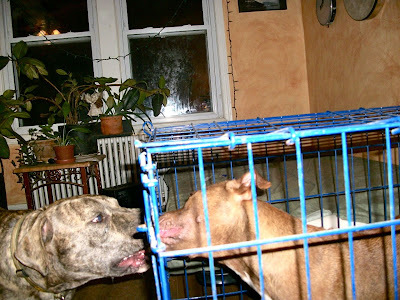 I'll let my pitties get pretty loud and vocal, and I'll allow them to chew on each other and slam each other and even climb on top of each other as long as I see that both are enjoying it and neither is trying to get away from the other. But when the vocalizations start to get a quality of desperation to them, when Fozzie looks like he's needing a break from that little perpetual motion machine, or when us humans just need a few moments of blessed silence, its nice to have a crate to put our little piglet in for a while. Always with a delicious chew so it doesn't feel like punishment. These time-outs are not only essential for everyone else's sanity, but I believe important as well for Sandy herself to learn to rein in her energy after bursts of wildness. So that in addition to her cuteness and sweet-temper, she can learn the self-control that will make her an even better ambassador for her breed. I think my Billy really appreciates having a way to calm down. Sometimes he just seems to overload his little brain and doesn't know how to settle. When I ask is he needs to go to his room he trots over quite happily, almost as if he's relieved that mom has taken charge and pushed the reset button. Time-outs are great tools to use, be it at home, using a crate, or at the park, having a minute of on-leash look-at-me-instead-of-going-crazy time. You make an excellent point. In helping her to contain her enthusiasm you are also letting her know how much is enough, and giving her an alternative. Great post! Awesome! You say it much better than I do in terms of training benefits of time outs. When a rescue friend first told me she put her dogs in timeouts, I did think of it as a punishment. Until I tried it. And loved how it can be a vital tool in helping a dog learn impulse control, routine, and respecting space! Not to mention that some day she may need to spend time in a crate if some sort of injury or illness were to occur. It's a lot easier to teach them to love the crate when they're young! Time outs can be very helpful. Just today I saw Honey getting a little too possessive with a toy at the dog park. I made her sit by my side while she calmed down a bit. Sometimes dogs just ramp up their excitement levels and have trouble relaxing. So we need to help them. Of course we'd probably also benefit from time outs too but just don't take them. I use training exercises for time out with my boys. When they start to get too riled up, I pull out some cheese or hot dogs and get them focused on me doing calm exercises like sit / down / stay. When they are calm enough for one dog to sit / stay while the other does a short trick (like spin) then I give them a good dog release and they are usually relaxed. Of course when they were puppies, yeah, sometimes a crate time out. I always trained my dogs that their crate was their safe cave and so "go to your house" was always positive for them. P.S. 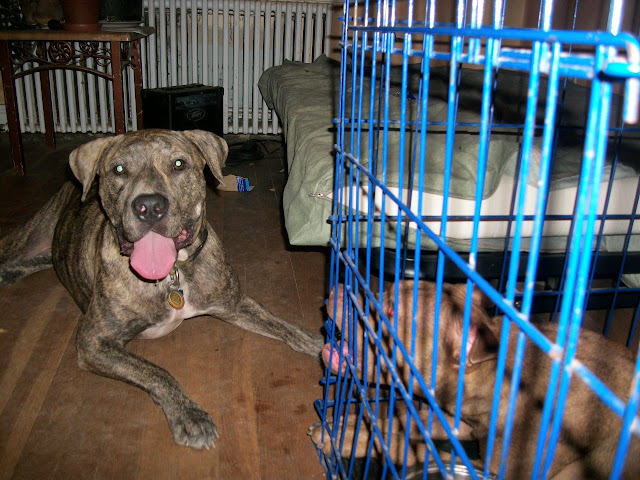 We had to forego crates as our house is too small for a crate large enough to house a 230 pound mastiff. It's too bad because I think Mango would like to still have a crate to retire to. I don't need time outs in the house-- Our Best Friend is perfect in the house. But he's actually learned to look UP every tree to find squirrels! I need him to be calm on a leash! Hi Kirsten, thanks for visiting my blog. You have an interesting blog. My mom believes in clicker and no-force (no punishment) training that also does not include choke or pinch collars. We wish that you could have helped Tinker and her mom before Tinker got sent back to Rescue. http://fernreedgmailcom.blogspot.com/ We'll be back to visit your blog again. I"m lucky in that neither Frankie or Beryl need crate time outs to calm down but they both have crates. Frankie has chosen to eat his meals in Beryl's and goes and waits in there until I feed him. Beryl has chosen to ignore her crate now that she gets to sleep on the bed with us:) I really should get around to making it a happy place for her again in case I need for her to be in there!